TELUS is set to unveil a new program called T-UP! that purports to make it easier and more economical to get a new phone every year. Though on the surface it appears to be similar to promotions by T-Mobile, AT&T, Verizon and Sprint in the U.S., T-UP! has one fundamental difference: it is (currently) limited to the iPhone 5s. 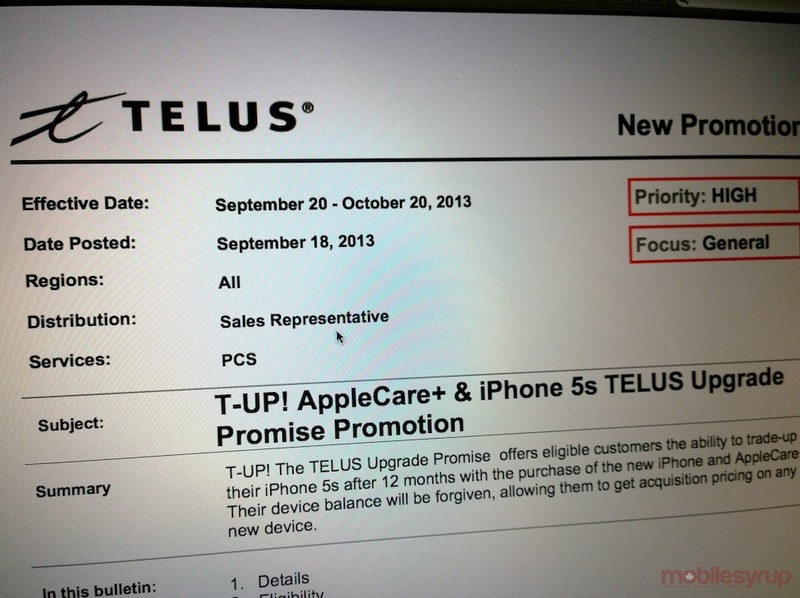 Beginning on September 20th and ending October 20th, customers purchasing an iPhone 5s in any size or colour from a TELUS store or dealer, along with a $79 AppleCare+ package, are automatically eligible to bring that phone in 12 months later for a brand new device at the subsidized price. All remaining subsides are forgiven and, as long as the iPhone 5s is in good working condition, any phone (iPhone or otherwise) is available at the fully subsidized price. While Canadian carriers have only recently implemented 2-year plans, it appears that there is demand for customers to upgrade more often. In December, once the Wireless Code of Conduct comes into effect, all device balances must be paid off in full within 24 months; T-UP! makes it easier to upgrade to a new phone after only 12 months. This is a very interesting system, and let’s work out the finer details. Say you buy a 16GB iPhone 5s on September 20th in-store, on a 2-year contract, for $229.99. Because the device costs $719.99, there is a $490 subsidy. After one year, that subsidy is halved to $245, as you’re paying off $20.41 per month until the end of a 24 month contract. By bringing in your iPhone 5s after 12 months you now have the option of forgoing the rest of your payment plan in favour of selecting a new device at a subsidized rate. Assuming you pick another iPhone or high-end smartphone with a similar $490 subsidy, you’re saving the difference between the remaining balance and the initial AppleCare+ payment. Assuming you decide to sell the iPhone 5s yourself after 12 months for, say, $500, and pay TELUS the remaining subsidy of $245 before purchasing a new phone at a subsidized price, you’d probably come out ahead, but would lack the AppleCare+ and ease of trade-in. This deal works largely because many customers want two things: to upgrade their phones every year; and to sign up for AppleCare with the purchase of a new iPhone. Since it’s expected that Apple will continue its annual iPhone refresh cycle, TELUS wins because they have customers re-signing a 2-year contract ever 12 months (lower churn) and engage with them more regularly (more accessory sales). We’ve confirmed that customers will be able to stay on the same plan as the previous year when signing up for a new device. Don’t fear, iOS 12 actually improves speed on old iPhones!